by Baase, Sara; Henry, Timothy M.
For courses in Computer Ethics and Computers and Society. 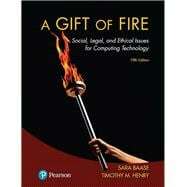 In Gift of Fire, A: Social, Legal, and Ethical Issues for Computing Technology , Sara Baase presents a balanced exploration of the social, legal, philosophical, ethical, political, constitutional, and economic implications of computing and the controversies they raise. With an objective computer scientist's perspective, and with historical context for many issues, Baase covers the issues readers will face both as members of a technological society and as professionals in computer-related fields. A primary goal is to develop computer professionals who understand the implications of what they create and how it fits into society at large. This text encourages readers to think about the ethics and philosophical direction behind topics but doesn’t them lead students to conclusions. The 5th Edition contains updated material on new topics and examples, outdated material has been removed, and several topics have been reorganized. New material appears throughout, including material on current trending topics such as drones and autonomous cars. Sara Baase is Professor Emeritus with the Department of Computer Science, San Diego State University, where she won awards for outstanding teaching. Her textbooks in computer science have been translated into several languages. Dr. Baase received her doctoral degree from the University of California, Berkeley. Timothy M. Henry has a Bachelor of Science Degree in Mathematics from the U.S. Coast Guard Academy, a Master of Science Degree in Computer Science from Old Dominion University, and was awarded a PhD in Applied Math Sciences from the University of Rhode Island. He began his IT career as an officer in the U.S. Coast Guard, and among his early tours, he was the Information Resources Manager (what is today a CIO) at the Coast Guard's training center in Yorktown, VA. Dr. Henry then switched over to education and taught mathematics and computer science courses at the U. S. Coast Guard Academy. As his time there ended, he was offered a great opportunity to work with 'bleeding-edge' technology in a research and development environment and oversaw projects for law enforcement, first responders, healthcare, and education. For the next decade he continued to work as a project manager on large corporate- or state-wide information systems. During that time, he obtained his Project Management Professional (PMP) certification. He then returned to a university setting where he has been teaching ethics, programming, cybersecurity, and project management for over 15 years. He now serves as IT Graduate Director at the New England Institute of Technology. In addition to co-authoring A Gift of Fire: Social, Legal and Ethical Issues for Computing Technology with Sara Baase, he has co-authored two data structure textbooks with Frank Carrano, Data Structures and Abstractions with Java and Data Abstractions and Problem Solving in C++: Walls & Mirrors, which won the 2016 McGuffey Longevity Award from the Textbook and Academy Authors Association. 1.4.1 What is Ethics, Anyway? 3.2.1 What Is O ensive Speech? What Is Illegal? 3.7 Net Neutrality: Regulations or the Market? 4.1.1 What Is Intellectual Property? 4.5.1 What Is Free Software? 4.5.2 Should All Software Be Free? 4.6.2 To Patent or Not? 5.2.3 Is “Harmless” Hacking Harmless? 5.4 Why Is the Digital World So Vulnerable? 5.6.2 Criminalize Virus Writing and Hacker Tools? 5.7 Whose Laws Rule the Web? 6.2.3 Are We Earning Less and Working More? 7.5.3 Intelligent Machines and Super-intelligent Humans–Or the End of the Human Race? 8.2.3 Why So Many Incidents? 8.3.2 Trust the Human or the Computer System? 8.4.1 Are We Too Dependent on Computers? 9.1 What Is “Professional Ethics”?